June 2017 – GRAITEC, an international BIM, Fabrication and Design software developer for AEC, and Autodesk® Platinum Partner in the US and across Europe, is delighted to announce a global contract with IDEA StatiCa covering all the countries where GRAITEC operates. 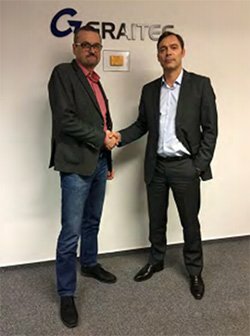 This distribution agreement sees the previous Idea StatiCa Connection joining the Graitec Advance Series, dedicated to the AEC and Fabrication markets, under the new name of "Advance Design Connection". The Advance Design family is used by over 6000 professionals worldwide who have done thousands of projects using this solution. The common held belief is that a structure is only as strong as its weakest link. Unless properly designed, the connections joining the members may be weaker than the members being joined. That is why the design of connections is an integral and vitally important part of the design of steel structures. Idea StatiCa is a Czech software developer providing engineering solutions dedicated to structural design and the code checking joints, cross sections, beams and other details. IDEA partnered with top technical universities to create a new method for the design of joints and implemented it into a software: IDEA StatiCa Connection. Currently existing programmes are based on a component method which is not general enough. IDEA StatiCa came up with a new method called Component Based Finite Element Model (CBFEM). CBFEM is a synergy of component method and finite element method. CBFEM is widely applicable and quickly provides comprehensive results about the joint behaviour. This is the product Graitec is going to distribute under the brand Advance Design Connection. Advance Design Connection completes our product offering providing a high innovative solution for complex joints, making our solutions for steel structures very strong technically. It can design all types of 2D\3D welded or bolted connections, base plates, footing and anchors. Clear pass/fail checks according to various design codes are available in minutes, as well as complete output reports. Advance Design Connection is fully integrated in a BIM workflow thanks to BIM links with several BIM solutions, including the 3D FEM system Advance Design. Our customers used to receive our own component solution for joints design: GRAITEC Steel Connection Designers, dedicated for standard joints, around 70% of the joints of a project. The remaining joints, the complex ones, only 30%, are very time consuming and take around 70% of the time allocated to the design of the joints. Today, we have a high quality and innovative solution for our customers to design joints thanks to Advance Design Connection which will allow to design any kind of joint, with any type of loads in a few minutes. Advance Design Connection comes with 4 BIM links to GRAITEC Advance Design, Autodesk® Advance Steel, REVIT Structure® and Autodesk Robot Structural Analysis®. More BIM links will be added in the future. This partnership between IDEA StatiCa and GRAITEC for this distribution is very important and strategic for both companies. Joseph PAIS, GRAITEC Product Director comments: "With this new partnership, GRAITEC offers a complete and effective suite of professional software's dedicated to the steel industry. With this suite, the steel companies will be able to combine a streamline structural workflow together with a high level of technical expertise." Lubomir SABATKA, CEO of IDEA StatiCa adds: "Our focused applications, based on advanced FEM approach, are filling the gaps in today's workflows of structural engineers and fabricators. We are excited to partner up with GRAITEC and looking forward to bringing this technology to the customers, together." An overview (not exhaustive) of the type of joints designed by Advance Design Connections. GRAITEC GROUP 2019 | WE'VE UPDATED OUR PRIVACY NOTICE - Click here to find out more about how we collect, store and handle your personal data and your rights.